In spinal stenosis, the spinal canal will become narrowed due to which it will place the pressure on the spinal cord. 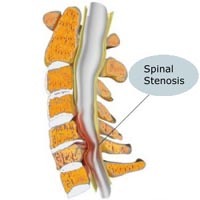 A condition where the stenosis is located on the lower part of your spinal cord it is known as lumbar spinal stenosis and if it is in the upper part of your spinal cord then it is known as cervical spinal stenosis. Live with an aroma of the latest medical technologies liable to assure one live healthier. Though the medical industry injects for hale and hearty living in, people have their presence inclined for medical clinics today, while meaning to be a disease-free. Therefore, take your step ahead for the medical treatments, such as spinal stenosis treatment in India that is deliberate to treat stenosis of spinal canal caused by narrowing of spinal canal. Though spinal stenosis brings itself an abnormal narrowing of spinal canal that may occur in any of the regions of the spine, this narrowing causes also a restriction to the spinal canal, resulting in a neurological deficit. With the spinal stenosis, the spinal canal gets narrowed at the vertebral canal, which is a foramen between the vertebrae where the spinal cord or nerve roots pass through. At Spine Surgery India, you may be believed to forget all the aspects relevant to spinal stenosis, as the company is fulsome of finest spinal stenosis treatment in India. The condition due to which the spinal stenosis occurs is the general wear and tear during a lifetime. As with the increased age of a person, the discs located between each bone in the spine will start shrinking, and the bones and ligaments start to thicken due to arthritis and chronic swelling. The other reasons due to which the spinal stenosis can is the previous injuries, trauma, or tumors of the spine, inherited conditions etc. The symptoms of the lumbar spinal stenosis present with cramping or back pain, pain in buttocks, thighs, or calves which can decrease your walking tolerance and your muscles become weak. There are chances that your lumbar spine symptoms increase when you walk for short distances and will decrease when you sit, bends forward or lies down. a) Medications: Your surgeon will prescribe some common painkillers to get relief from the pain and other medications which include muscle relaxants, anti-seizure. b) Corticosteroid injections:The surgeon will recommend the steroids injections which help in the subsiding the inflammation. c) Exercise or physical therapy:This will help you to get rid of the pain. d) Anaesthetics:This injection will block your nerve which can stop the pain for some time. e) Assistance device:Your surgeon will advise you to wear braces, corset or walker which helps you while walking. a) Laminectomy:This is a procedure in which your surgeon will remove the back part of your affected area vertebra. There are cases in which your surgeon will link your vertebra to the adjoining vertebrae with metal hardware and a bone graft (spinal fusion) to maintain the stability and strength of your spine. b) Laminotomy:This is a procedure in which your surgeon will remove only a portion of the lamina to relieve the pressure in a particular spot. c) Laminoplasty:This is a procedure which your surgeon will perform only on the vertebrae in the neck. In this procedure, the space within the spinal canals is open by creating a hinge on the lamina. Metal hardware provides a gap in the opened section of the spine. EMG: In Spinal Stenosis, Electromyography (EMG) is a test that verifies the health of the muscles and the nerves that control the muscles. So, consider this as a diagnostic procedure meant to evaluate the health of muscles and the nerve cells that control them. Spinal MRI: An MRI is a test that makes use of a magnetic field and pulses of radio wave energy to create pictures of the spine. In the many cases, an MRI offers different information than an X-ray, an ultrasound, or a CT scan. Spinal CT scan: A computed tomography (CT) scan of the spine renders as an imaging method that makes use of x-rays to produce cross-sectional pictures of the lower back. X-ray of the spine: Get to Spinal X-rays the pictures of the spine. Yes, they may be taken to find injuries or diseases that have an effect on the discs or joints in your spine. These problems may take in spinal fractures, infections, tumors, bone spurs, or disc disease. Foraminotomy: Foraminotomy is a kind of surgeries that widens the opening in your back where nerve roots leave your spinal canal. At this surgery, you may have a narrowing of the nerve opening. Laminectomy: Know Laminectomy a surgery to take away the lamina, part of the bone that makes up a vertebra, or bone spurs in your back. Really, the procedure can take pressure off your spinal canal. Spinal fusion: Spinal fusion adds itself as a surgery to lastingly join together two or more bones in the spine, so there is no movement between them. Expert answers from spine surgeons, chiropractors and physical therapists to cure your back pain. We pack your spine surgery treatment in such a way that you are picked up from airport by an ambulance, operated in the hospital the next day, made to walk the next day and dropped back to airport, all by our team. Our team of surgeons and medical professionals know that you expect excellence. We strive to go beyond your expectations and deliver quality and patient centric care at each of our centres. How can I choose which spine surgery centres are the best for me ? Our great thanks to the team of Spine Surgery India professionals who were with us from our initial stage of the Spinal Tumour treatment until the final recovery. They are the one who informs us about our health condition and also suggests us the ways to improve it and allow us to live a better quality of life. We give credit to the staff members at Spine Surgery India who rectify the problem and provide the best Endoscopic Spine Surgery. The professionals at the Spine Surgery India use the best and latest medical approach to correct the problems related to people spine. We wish thanks to the team of professionals at Spine Surgery India who allow us to stay healthy. I really thankful to the professionals at Spine Surgery India who helped me to get rid out of serve cervical pain which is not only affecting my professional career but my personal life, as well as I, am unable to enjoy the activities with my kids because of bad cervical pain. I wish good luck to the team of Spine Surgery India. You all are doing a great job. Our great thanks to Spine Surgery India a best medical approach to correct the problems related to the spine. We both are affected by the spinal problems. I was dealing with severe pain in my neck and my husband was dealing with pain in his back from a long period of time and all other non-surgical treatments were failed to provide us relief from pain. However, when we visited Spine Surgery India there we found the best spine specialist from around the world as well as the dedicated surgeons who believe in providing only the best services to its patients. The aim of the spine surgeons in India has always been to correct their patients back and neck conditions and help them in returning their normal routine quickly. They offer us a complete range of diagnostic and treatment services for various problems of the spine and help us to recover from neck and back pain. No name stands heightening as Spine Surgery India has its presence at my heart. Meaning that this only address comes specialized to treat every spinal condition with no pain as well as with modern medical technologies to spine, spinal cord injury fm Spine Surgery India has pleased me a lot. Yes, this kind of spinal treatment to have treated well on damage to my spinal cord and its nerves has thoroughly added itself one of most reliable latest spinal treatments. So why to look for the next one after I have amiable address to you go at Spine Surgery India is all-answers of providing best-in-class spinal surgeries and treatments. What to expect more after the modern medical science shows its hands expert into pleasing one breathe in hale and hearty gulp of living. Here, Spine Surgery India has been one-stop destination to me from all over the world, in availing me the best and reliable cervical spine surgery to get me relieved from neck and radicular pain into my shoulder and arm. Really, a whole-heartedly thank from myself goes for Spine Surgery India to have pleased me a lot and has compelled me to come again in India considering well to itself famous among foreigners to great reception. With the whole-heartedly thank for Spine Surgery India in availing best spinal replacement surgery, I have experienced excellent on treating my spinal disabilities well by artificial spine replacement.more.. I want to show my deep gratitude to Spine Surgery India. Thereby, my experience with the company renders amazing. Really, they assisted me choose the best hospital for lower back surgery. So, thanks to Spine Surgery India to have treated my lower back pain.more.. Yes, a big thank from my wife and I goes for Spine Surgery India to have experienced me incredible from starting-to-end. Also, each and every minute detail from travel arrangements to communicating with health professionals in India went off without a hitch.more..
With no doubt to say that the results of my neuro-spine surgery are outstanding at Spine Surgery India. The whole experience at the company was actually better than I had expected. I want to give full marks to this great company. So, the affinity and love by Spine Surgery India became stunning.more..
My wife and I found the Spine Surgery India experience incredible from starting to end. Each and every minute detail from travel arrangements to communicating with the health professionals in India went off without a hitch. The talent of my surgeon and the level of care and support from everyone at the hospital were just superb.more..